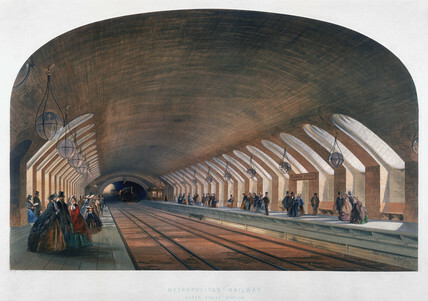 Chromolithograph by the Kell Brothers after their original drawing, showing pasengers waiting on platforms at Baker Street underground station. A steam train is arriving at one of the platforms. The Baker Street line, built by the Metropolitan Railway, was the first underground line to be built in London. It was opened on 10 January 1863 and ran from Baker Street to King's Cros. Dimensions (overall): 518 mm x 745 mm. Charing Cross Railway Station, London, late 1860s. 'Charing Cross Railway Station', London, c 1863. Metropolitan Railway, Bellmouth, Praed Street, London, c 1868. The Charing Cros Bridge, London, c 1860. 'Machine for Dredging Puddle Chambers', Canada, 1860. 'Laying Bottom of Tube', Victoria Bridge, Canada, 1860.